In 1871 he opened a shop called the Iron Foundry and Mechanical Workshop in Mannheim. The business, which was later renamed the Factory for Machines for Sheet-metal Working, did terribly in its first year of business. A large part of the initial failure was due to a flaky business partner of Benz’s. Karl Benz’s wife, Bertha, used her dowry to buy out his partner and fund the business a while longer. The business began doing well when his inventions began garnering attention. In 1879 he patented the two-stroke engine. After that he received patents for the spark plug, carburetor, clutch, gearshift and the water-cooled radiator. The modern engine was truly invented in his shop. Benz was a genius inventor who was ahead of his time. Many companies began using his inventions and paid him a fee. Companies like Daimler and Maybach, Peugot, Oldsmobile and Ford began to pop up before WWI and changed the world. Ford’s company is famous for the rate at which he could produce vehicles and is often wrongfully credited with the invention of the automobile. What Ford did was automate the process of making vehicles, and invented the modern assembly line. By 1914, Ford was able to make a black Model T every 93 minutes. The Model T was the first car that was affordable to the common man and Ford famously paid his employees high wages and demanded high efficiency in return. An assembly line worker at the Ford Motor Company could buy a Model T with four months pay. For Karl Benz, his dreams of designing automobiles stopped when he Design Management in 1903. Before that, his 1894 Benz Velo became the world’s first inexpensive, mass-produced car. To experience the Benz tradition for craftsmanship and excellence, and to see the latest Benz vehicles, visit Mercedes-Benz of Tucson. The 2014 turbocharged Mercedes that has won 7 out of the first 8 Formula 1 races this season. The 2014 Formula 1 season started this year on March 16 at the Melbourne Grand Prix Circuit in Melbourne, Australia. Before the season, 9 out of 10 race enthusiasts would have bet that Sebastian Vettel would have easily taken the Drivers Championship for Infinity Red Bull Racing as he has each of the last four Formula 1 seasons. However, Vettel and Infinity Red Bull racing have seen their reign end unceremoniously only halfway through the 2014 season. This is due to a Mercedes-Benz AMG Petronas driver winning 7 out of the first 8 races of the season, including the most recent race on June 22. This win was especially hard to predict because this years Austrian Grand Prix took place at the Red Bull Ring in Spielberg, Austria, which is essentially the home-court of Infinity Red Bull racing. Nico Rosberg and Lewis Hamilton are the drivers for the Mercedes-Benz AMG Petronas team. They have won enough points in the first half of the season to virtually eliminate the chance any other driver for any other team can win the Drivers Championship. Mercedes-Benz has all but already won the Constructors Championship trophy given to the team whose cars do the best overall. In the first 8 races, the two Mercedes F1 cars have taken first and second place 6 times. In the other two races one car was forced to retire early and in each of those races the other Mercedes won or took second place. In each of the first 8 races this season, the worst a Mercedes car has finished is 2nd place. At this point in the season, Nico Rosberg and Lewis Hamilton are only competing against each other, while Vettel has yet to finish better than 3rd place. For a taste of the Mercedes racing heritage, test drive a 2014 CLA-45 AMG Coupe at Mercedes-Benz of Tucson. Visit www.mercedesoftucson.com to view the complete Mercedes-Benz AMG lineup. BlueTec sounds fancy, but it is an easy term to understand with a little explanation. It all started in 1936 when Mercedes-Benz built the 250D. It was a car that delivered great performance with 30 percent better fuel economy. That power and efficiency came from a fuel that had never powered a car before then…diesel. Since then, Mercedes-Benz has been at the forefront of diesel innovation with the advent of the first turbodiesel in 1977 and Commonrail Direct Injection in 1997. BlueTec cars are some of the world’s most advance diesels, offering ultra-low emissions, high fuel efficiency and robust performance. They are 50-state certified and highly desirable cars to drive. To test drive a Mercedes-Benz BlueTec model, visit Mercedes-Benz of Tucson today. Diesels may have gotten a bad reputation from the 1970s and 1980s thanks to some poor craftsmanship and technological limitations of the time, but they have come a very long way from the days of soot-spewing exhaust pipes. Today, BlueTec is the culmination of advance technologies to create the world’s cleanest and most environmentally friendly automobiles. High-pressure fuel injection and variable vane turbochargers create a more complete and powerful combustion in the chamber. The most innovative advancement that Mercedes-Benz BlueTec offers is a solution called AdBlue. AdBLue is injected into the exhaust system that converts noxious nitrogen oxide emissions into harmless nitrogen and oxygen. Mercedes BlueTec models not only can use ultra-low-sulfur fuels, which are standard nationwide, but also B5 biodiesel. Another appealing aspect of a BlueTec Mercedes is the performance benefit of a diesel engine. While they may not produce high horsepower, they do produce massive amounts of torque. Torque translates into acceleration and a level of enjoyment usually reserved for sports cars with traditional gasoline engines. There are a slew of new Mercedes-Benz vehicles that offer BlueTec diesel technology. The E-Class sedan and GLK-, M- and GL-Class SUVs are all offered in BlueTec trims. With stricter fuel economy regulations expected, the proliferation of BlueTec diesel technology will only expand throughout the Mercedes-Benz lineup. BlueTec technology blends performance and efficiency in a way no other technology currently can. Check out a Mercedes-Benz BlueTec vehicle today. 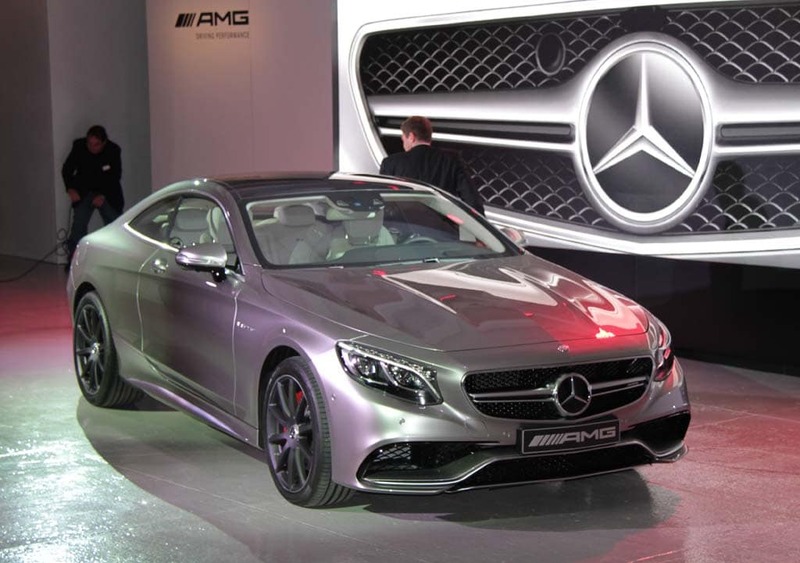 The all-new 2015 Mercedes-Benz S63 AMG 4MATIC Coupe made its official debut last month at the 2014 Geneva Motor Show and it has been receiving nothing but positive vibes and excitement. The 2015 vehicle will be available in the Mercedes-Benz of Tucson showroom this November. Many will be familiar with the S63’s cousin, the S63 AMG sedan. This coupe, however, has more of a sporty look and also comes with 4MATIC all-wheel drive as standard in the United States market. No pricing has been released just yet but the top-of-the-line S63 AMG 4MATIC vehicle is expected to be over $200,000 and well worth it. The S63 gives the driver full control of the vehicle with the power that comes from the twin-turbocharged 5.5-liter V-8 engine. In addition, it delivers an impressive 585 horsepower and has AMG’s Speedshift MCT seven-speed automatic transition. The power of the coupe is so massive that it can go up to 62 mph in only 3.9 seconds. A speed limiter tops it out at 186 mph. Driving the car makes it feel as light as a feather with the new lightweight design created especially for the S63 Coupe. It is dramatically 140 pounds lighter than the previous model, the CL63 AMG. The standard AMG performance details include the sport exhaust system with automatic exhaust flaps. There are also unique elements to the S63 like the option of the hands-free access to the keyless entry and a new three-spoke AMG sport steering wheel. Drivers also have the option of the Burmester Surround Sound System and the touchpad that allows the driver to take control of the radio, navigation system, and all other devices connected via Bluetooth, such as mobile devices. Inside of the S63 is the perfect mixture of luxury and comfort. The instrument panel has a wraparound design that is transitioned all the way to the doors. The interior has a sporty and exclusive look with AMG-branded bucket seats, embossed AMG logos on the arm rest, and gorgeous Nappa leather perfectly fitted throughout the vehicle. The S63 also offers a new accessory called “Standard Magic Vision Control,” which cleans the windshield unnoticeably by providing light sprinkles through the wiper blades. The perfect phrase to describe this too-good-to-be-true vehicle is, “A Dream Car,” which is how Mercedes-Benz describes it. It is promised to be one of the most desirable luxury sports cars in the world.